Planning your bridal look is a big deal and one of the conundrums brides-to-be often face is what hair accessories to pair with a veil. Here are our expert tips on variations of veil and finding the perfect hair accessories to match. A veil positioned on top of your head, towards the front of your crown, makes the veil a key part of your look. 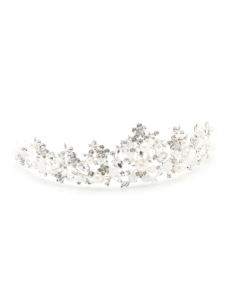 It’s a classic wedding profile – both Kate Middleton and Meghan Markle wore their veils this way – and is the perfect opportunity to embrace your inner princess and complete the ensemble with a beautiful sparkling tiara or headband. Most veils come with a discreet comb which the headpiece can sit on top of, or in front of. Front-positioned veils work wonderfully with glossy French pleats, where the hair is rolled and pinned at the back of the head, as well as sculpted and tousled bridal buns. Wearing a veil slightly front of the crown also complements half-up, half-down hairstyles, especially when the hair left down is coaxed into soft romantic curls. 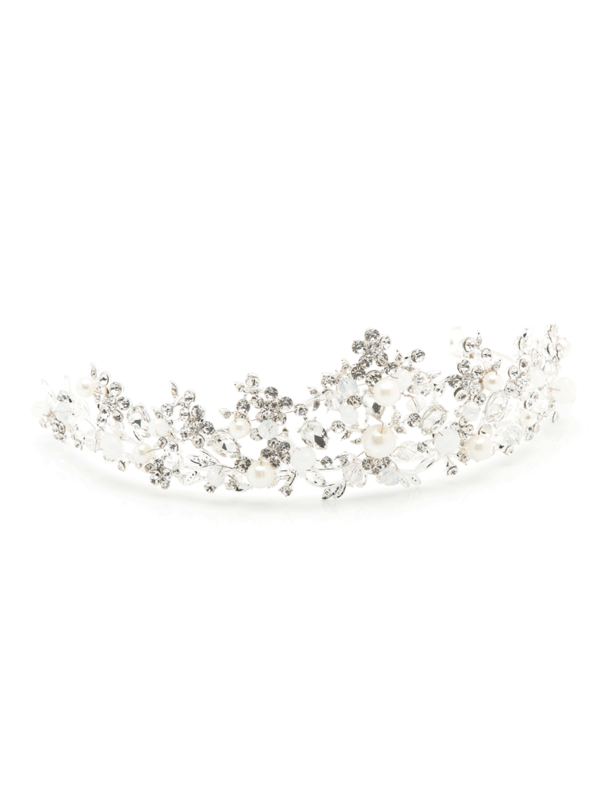 Tiaras and headbands are the ideal accompaniment for front-positioned veils. They also work with two-tier wedding veils that include a blusher – a section of the that pulls forward over your face and is swept back during the ceremony. 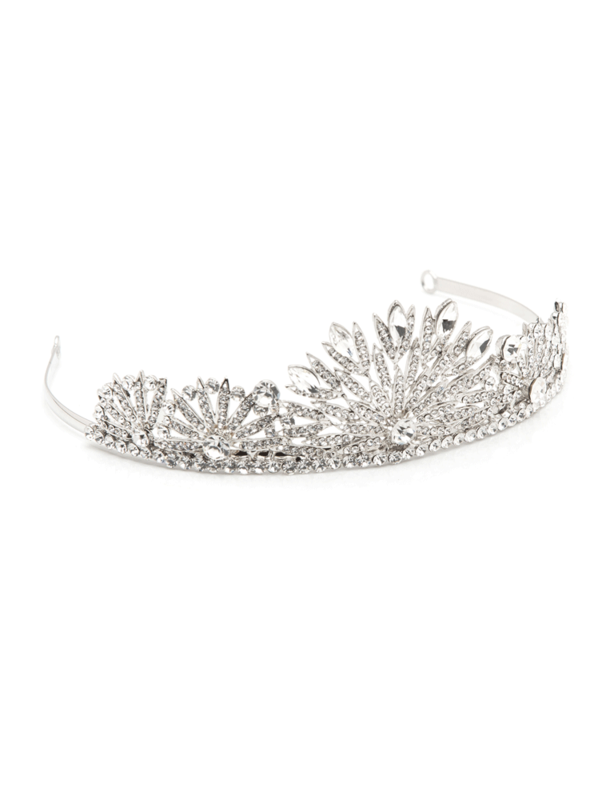 For maximum sparkle, as showcased by Meghan Markle on her wedding day, try the crystal-encrusted Harper tiara, or our show-stopping silver Hailey tiara crown. Bridal Headbands also work well with front-positioned veils. 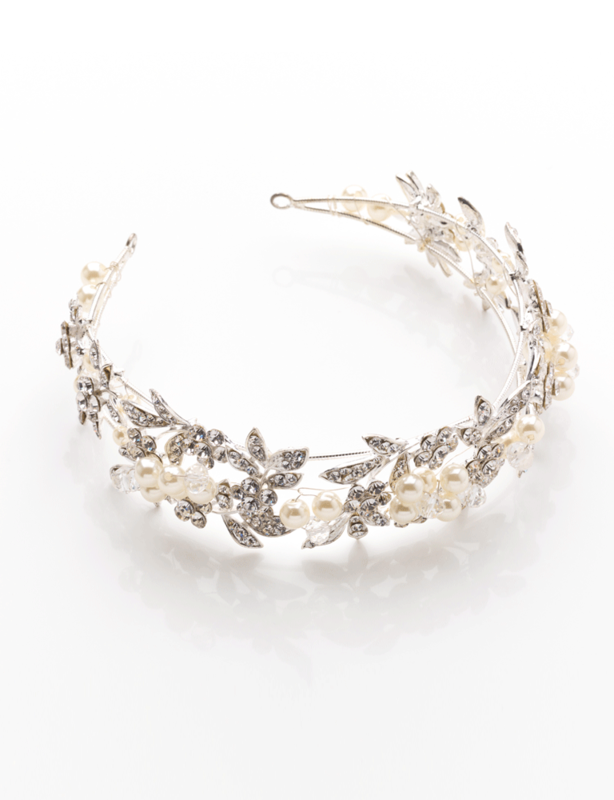 Less prominent than tiaras, headbands and hairbands fit snuggly to your head, creating a subtle band of shine. If you’re a fan of traditional white wedding styling, wear your headband across the front of your veil. 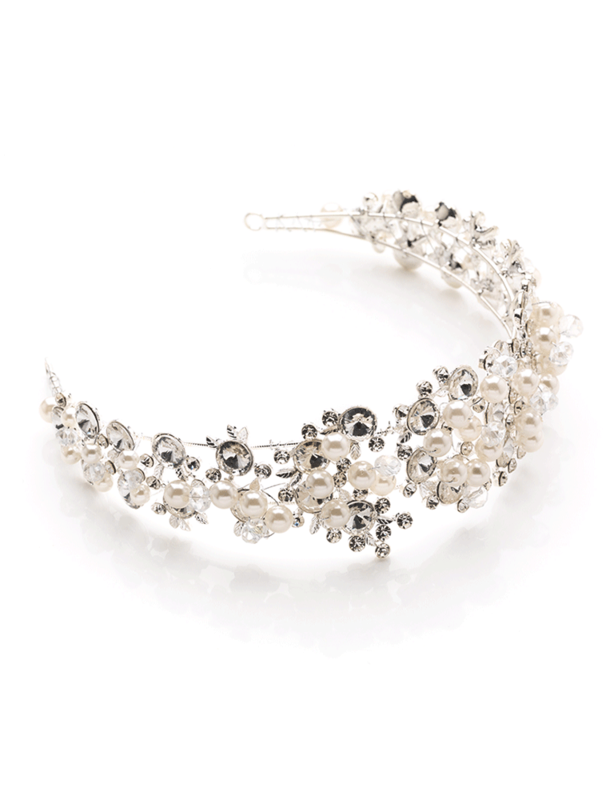 Headpieces such as our Amelia headband with rhinestone and pearl details or our Estella headband with rounded crystal and pearl clusters make exceptionally elegant veil partners. 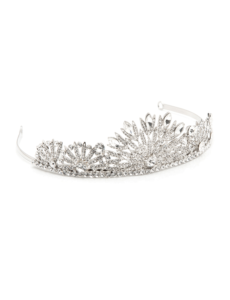 Top Tip The beauty of wearing a tiara or headband is that if you want to remove your veil, you can do so while keeping your headpiece in place – just remember to remind your hair stylist on the day. Veils positioned further back on the head are extremely versatile and usually comprise single-tier fabric which drops down the back of the dress. There is no blusher attached and they can vary in length hugely, from cathedral veils measuring around 300cm which trail behind the bride, to elbow length veils which, as the name suggests, finish a touch below the elbow. Single-tier veils can be worn with a myriad of hairstyles – fastened with a pretty hair comb or hairpins above or below a bridal bun, tucked into a classic high bun, pinned at the back of a half-up hair style, or nestled among long, loose waves. If you opt for a low bun, depending on where you place your veil above or below the bun, a beautiful bridal hair comb makes a realty pretty adornment. Our sparkling rose gold Esme hair comb has a gorgeous vintage vibe and looks perfect pinned above a veil. 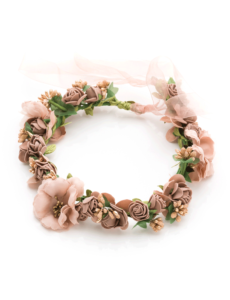 For bohemian, festival and laid-back country weddings simple, elegant wedding headbands worn in a halo position with the veil attached or entwined at the back are stunning. For inspiration, see our exquisite crystal-covered Ava headband – as featured in Tie the Knot magazine – or our Blossom flower crown, plump with blush and gold coloured roses. The Juliet Veil or Cap Veil is enjoying a revival since it first became popular in the 1920s. Gloriously retro, the Juliet veil comprises one piece of fabric, usually tulle, worn as cap on the crown or towards the front of the head with delicate knots or clips positioned each side. If you’re keen to wear your hair down or half-up, the Juliet veil is for you. 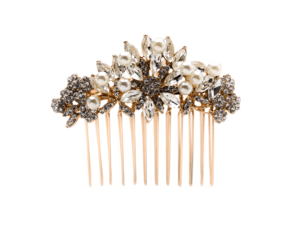 It sits beautifully atop natural waves, as seen on Kate Moss at her vintage-inspired wedding. Beaded and lace hair wraps provide the ultimate finishing touch to a Juliet veil. 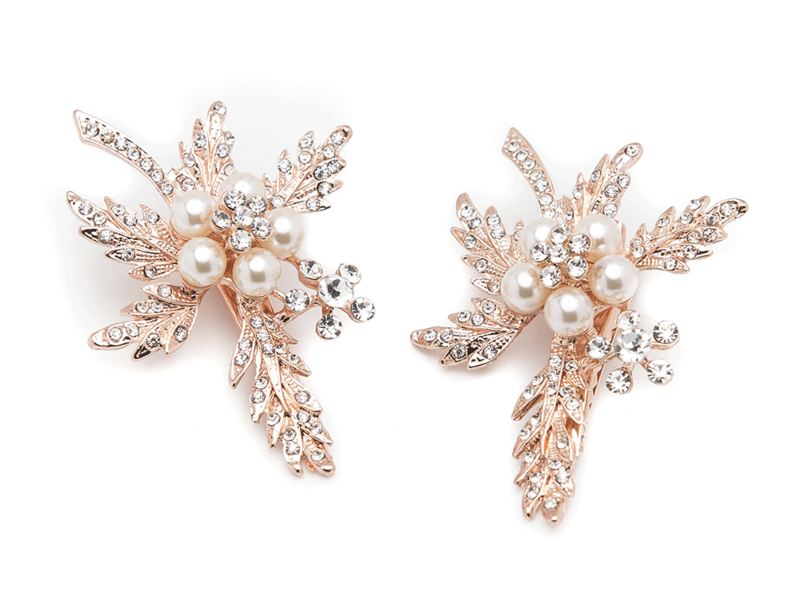 As well as fitting seamlessly, they tie with long luxurious ribbon at the nape. 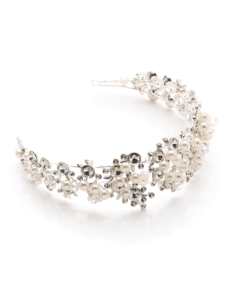 Slimline or statement, you’ll find the perfect bridal hair wrap to suit in our award-winning collection. Top Tip Pssst! If Princess Leia side buns aren’t your thing, you can pin the sides back of your Juliet veil with super cute hairclips or hairpins . 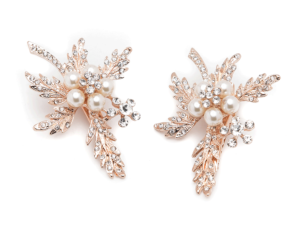 Our crystal and ivory pearl Daisey hair clips are as pretty as-a-picture and even come in pairs! I Really enjoyed this blog. Very inspiring with many beautiful pieces and great ideas too.